For the AI counterpart, see Scrake (Killing Floor 2). The player-controlled Scrake is one of the playable ZEDs in Killing Floor 2's Versus Mode. 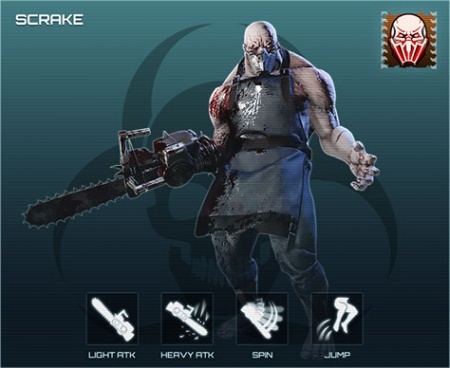 It is a melee-only ZED that, along with the Fleshpound, might be considered as a highest threat due to its high amount of the health, speed, damage and ability to perform unparryable AOE attacks with its chainsaw. Due to Game Conductor mechanics, player-controlled Scrakes have their health modified based on the average level of the Survivor team. Values vary within (x0.85 - x2) range. Player-controlled Scrakes have a wide variety of damage type resistances and one notable weakness. Scrakes are neutral to microwave and are resistant to other non-ballistic damage types. Scrakes resist to every type of ballistic weaponry except rifles and are significantly resistant against sub-machine guns. Scrakes have only one unique weakness that they share with their AI counterpart which is an impact damage of the RPG-7 projectile. Scrakes have only one weak spot, which is the head. Their chainsaw mitigates half of the incoming damage. Secondary: Powerful chainsaw slashing attack. Secondary + Back: "Gutbuster" stab attack. Block. Damage multiplier (firearms) - x0.25, Damage multiplier (melee) - x0.25. Cooldown - 0.2s. Heavy attack. Damage - 15. Maximum hit range - 2m. Vs doors - x5 more. Cooldown - 1.5s. Whirlwind attack. Damage - 15. Maximum hit range - 2m. Vs doors - x5 more. Cooldown - 2.5s. Note: Rage (sprint) thresholds: Normal / Hard / Suicidal - 0.75, HOE - 0.9. When enraged Scrake can do bump damage to human players (damage - 2, radius - 2.4m, this type of the damage is radial, i.e. scales over distance). All melee attacks except for "Gutbuster" attack do full damage to players - x1 and vary by possible amount of the hits. Player-controlled Scrakes start spawning at the third wave of the normal versus game. Enraged Scrakes do damage to player just by standing nearby. Maximum human-controlled Scrakes allowed, per cycle AND / OR active at once - 2.